The Mystery Writers of America has announced the Edgar Award winners! And unlike last year, where my taste totally reflected the taste of the judges… we are not in synch. In fact, 180 degrees difference. I picked Tana French’s Faithful Place for Best Novel. MWA picked Steve Hamilton’s The Lock Artist. I placed this one… dead last in the running. Augh. A revisit of my review reveals that I still agree with my comments. Hamilton is a great author – I’ve loved his previous series – and The Lock Artist was very creative and a fun read, but I didn’t find it to be my preference. Similarly, for Best First Novel, my pick was Nic Pizzolatto’s Galveston. MWA’s choice: Rogue Island by Bruce DeSilva. Again, this book was at the bottom of my list. I looked back over my review. Yep, still agree with it. The book has sheer verve going for it, but it’s not as edgy as I prefer. Bottom line: If you haven’t read all the nominees, do so! They’re all excellent and well worth your time. You can’t go wrong with the established authors nominated for Best Novel, including Tana French, Harlen Coben, Tom Franklin, Timothy Hallinan and Laura Lippman. For the debut novels, you may find that Rogue Island is your favorite, or perhaps the humor and quirky characterizations of David Gordon’s The Serialist will float your boat. All five nominees are an opportunity to expand your “must read” list. My final take on being so wrong? No biggie. It’s like the Oscars. “Predict the Oscars” contests reward those critics who are best are predicting what nominees will be selected by the Oscar voters. I am more like the critics who pen “who should win” columns. But even with that perspective, this undertaking is all very subjective! Still, it’s terrifically fun, so 2012 will find me doing the same thing. Maybe I’ll even go to the ceremony! Edgar Rankings: Who the heck is Poke Rafferty? I had never read anything by Timothy Hallinan prior to my instantaneous purchase-by-Kindle of the Edgar-nominated The Queen of Patpong. With nothing to hold in my hand – no blurb on the back of the book, no book jacket bio – I plunged into the the underbelly of Bangkok. Bar girls, tough guys, and plenty of bought-and-sold. In the first chapter, a predatory American circles and pulls in a 16-year-old bar girl, only to be stopped by a corrupt Thai policeman who is ready to let the girl go to certain torture and death – for a price. Between the two of them, they scare the cr*p out of the girl, who takes off in a big hurry for the farm she left behind. In the final paragraphs, it becomes obvious that the policeman and the tall American are in cahoots, with the goal of saving the girl. And that was it. I was hooked. It turns out that this is the fourth Poke Rafferty novel, Poke being the tall American and Arthit his policeman friend. Poke’s evidently a travel writer, although we don’t see much traveling or much writing in this book. He’s married to a former bar girl, Rose, and they’ve adopted a 13-year-old named Miaow (but she wants to go by Mia). Life gets exciting and scary when a man from Rose’s past – a seductive mercenary who has left a trail of murdered young women behind him – finds her again. Fortunately, he’s the kind of sociopath who likes to play with his prey, because if he had just gone for the kill right off the bat, the book would have been maybe 50 pages long. If you’re noticing, this is the fourth book out of the six nominated that hinges on action from the past. If the trend continues and we end up six-for-six, that’ll really be something unusual. For sheer engagement, The Queen of Patpong is tops. The reader sees the love between Poke and Rose, the family the three of them have made together, and their friendship with Arthit. The backstory is well-told and is doled out over time, ratcheting up the suspense. By the time I was reading about Rose’s encounter with Howard Horner on the rocks – he has plans to kill her, but she outwits him – I couldn’t read fast enough. It reminded me Tom Hanks in Apollo 13 – you know the astronauts survive, but you’re on the edge of your seat anyway. Also good about the book – the bad guys were not just believable, but real, and the meta-message – that the U.S. government would protect black ops mercenaries who killed civilians for fun – was chilling, but in today’s world, also believable. The downside to The Queen of Patpong is pretty minor: if you haven’t read about these characters before, it takes a little catching up. The world of Bangkok is not readily familiar, so that takes a little catching up, too. This is quite a different novel, some mystery but mostly thriller, and Rose fills the pages. It’s a tough call, but it doesn’t quite edge out Laura Lippman’s book, although it’s definitely ahead of Harlan Coben’s Caught. I “amazoned” Hallinan, and I see he has quite a backlist… guess I know what I’ll be reading when the Edgar countdown is over! Harlan Coben’s a best-selling author, and deservedly so. I started reading his Myron Bolitar series (a frequently-funny series featuring a short-time pro basketball player turned sports agent) with Deal Breaker in the mid-90s. Myron’s best friend is Windsor Horne Lockwood III… a very handy guy to know when you need an incredibly rich, incredibly connected, and basically all-around incredible guy. Win shows up in Caught in a minor role – a cameo, if you will. 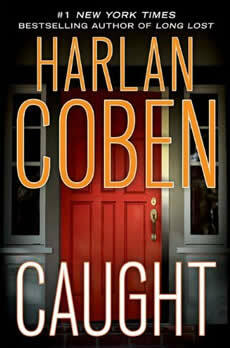 Coben’s also a prolific producer of standalone thrillers, and Caught is a good example of the bunch. It’s told from multiple perspectives, but the whole plot hinges on a “caught on camera” reality TV show that purports to reveal pedophiles. You’ve seen the shows… the guys are amazingly stupid, showing up with a pocket full of condoms and a six-pack under one arm for a rendezvous with a 13-year-old girl in her parents’ hot tub, only to be greeted by a reporter in a flashy suit with a camera crew. The guy never runs for the hills, they always stick around to explain themselves before being handcuffed and shoved into the back of a police car. Only in this case, the predator who is caught, Dan Mercer, seems like a true-blue guy. There are some questions about his past – it’s a little murky – but no warning signs, ever, even though the case seems all locked up. Even cynical reporter Wendy Tynes is beginning to have her doubts when he is suddenly murdered – right in front of her eyes – by a masked man she’s sure is the father of one of Mercer’s victims. But Wendy’s a better investigative journalist than her schlock-TV producers know, and as she pulls on the threads that make up the evidence against Mercer, she finds they unravel… and in the unravelling, she uncovers an alarming pattern: Mercer is just one of a group of college room-mates whose professional lives have been ruined, often by no more than internet-chat-room rumors and innuendo. Excellent things about this novel: Twisty plot and I didn’t figure it out in advance (which I frequently do!). Believable single mom main character with great mother-son interaction. Not so great: Backstory with tragically hidden-from-life character seemed a little gothic to me. Especially with a first-person prologue, I never felt that Mercer was dead and kept expecting him to pop back up… which, of course, he did. Still, Coben’s a skilled writer and Caught stacks up well. Like a lot of places, New York City doesn’t have as many bookstores as it used to have. On the other hand, the number of Starbucks outlets has increased exponentially in the last ten years. And it continues to have plenty of guys selling handbags and watches, as well as helpful folks wanting to make sure you don’t miss an opportunity to go to a comedy club. But mystery lovers who make an effort will be rewarded. A short subway ride to Greenwich Village will bring you to the doorstep of Partners & Crime. What’s great about this bookstore is the many hand-lettered signs, helping you find the books you’ll most enjoy reading. I discovered a Kate Atkinson, When Will There be Good News?, that I am currently enjoying. Atkinson’s book interweaves several perspectives and backstories in a way that reminds me that there’s more to mysteries than clomping through a chronology in first person. (I can diss this style because that’s what I do.) Good News is out in paperback and a heck of a bargain, so go buy it. I also bought a thriller, Close-Up, by Esther Verhoef and translated from the Dutch. I read a couple of chapters in the store to be sure, and its got me hooked already. Margot’s just getting over a rough break-up when she meets a mesmerizing man… he opens new doors for her, she’s spreading her wings. Only the reader suspects he’s a killer. But is he? Also worth visiting is Otto Penzler’s Mysterious Bookshop in Tribeca, especially when accompanied by lunch at the Kitchenette, a thrift store stop, and less than 30 minutes in line at the TKTS booth to snag two tickets to Billy Elliott at half-price. I was lured into a signed copy of Caught by Harlan Coben (always a favorite) as well as Linwood Barclay‘s Never Look Away, after reading a comparison of the two books in today’s New York Times. I’ve read both authors before and am interested in reading them back to back. 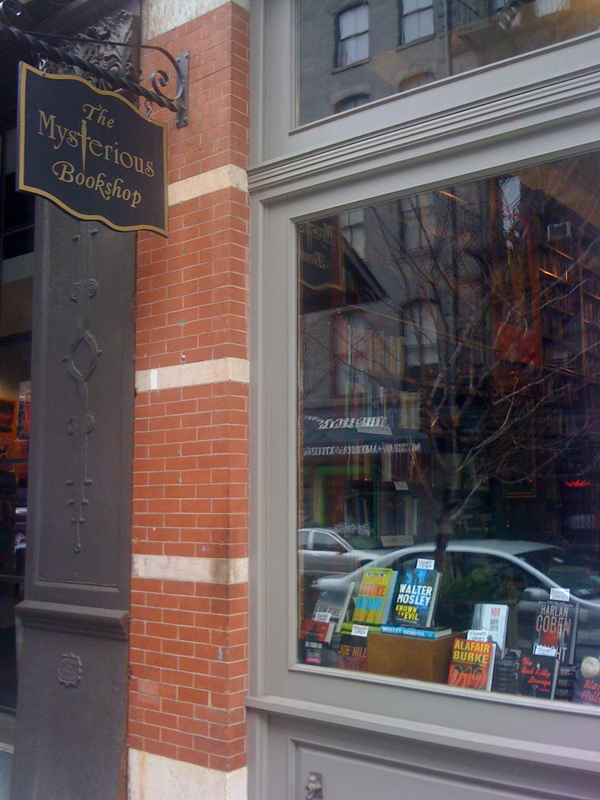 The Mysterious Bookshop’s allure is burnished by its owner, Otto Penzler, well-known on the mystery scene for decades and editor of the Best American Mystery Stories and the Best American Crime Writing series for years. So well-known is he that he was tapped to write Robert B. Parker’s obituary in Time magazine. 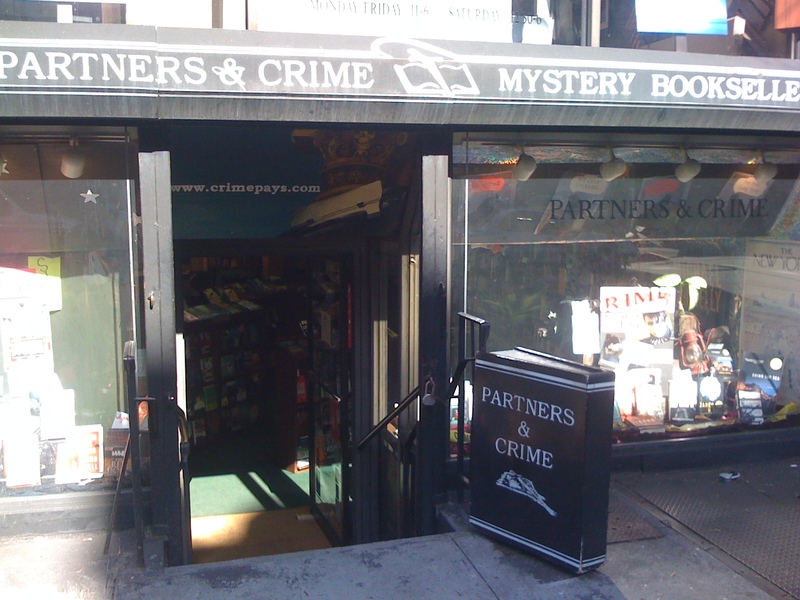 Both mystery bookstores are comfortable, ready for browsing, and feature comfortable chairs and nearby coffee shops. Both are stuffed to the gills with autographed books. And both are well-worth visiting, so bring your credit cards and a canvas bookbag!